Shubert, a lightning bug, decides he will be helpful today, no matter what! As he enters his classroom, he finds Lucinda throwing down her backpack and kicking Etta. 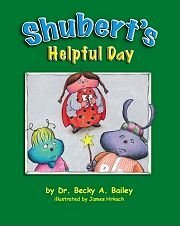 Find out how Shubert and his classmates help Lucinda uncover her real problem and find a solution. Mrs. Bookbinder, the teacher, models ways for adults to view misbehavior as a "call for help" rather than an act of meanness. Find out how she builds a school family where all class members feel valued and safe enough to help turn hurtful situations into helpful communication skills. If you have any questions about this product by Loving Guidance, contact us by completing and submitting the form below. If you are looking for a specif part number, please include it with your message.